So, why do we have the EGR System? The EGR System is a simple (but problematic) emissions reducing device specifically introduced to reduce NOx emission. When the combustion gasses heats up excessively, nitrous oxide NOx is produced. To reduce the production of NOx, the engine’s combustion temperatures needs to be reduced and the EGR system allows recirculated exhaust gas back into the inlet side of the engine. This is a continuous process and the EGR valve remains open on cruise and all the way up to just before wide open throttle. At wide open throttle (WOT) emissions are not tested and so manufacturers close the valve and allow a full shot of fresh air to allow the engine to develop max power. Some EGR applications can have the mapping of the valve changed to reduce the actuation, but most simply choose to close the valve at WOT. The concept is obviously sound, but the implementation is sometimes questionable. A case in point are exhaust gas re-circulation (EGR) systems. The theory behind the EGR system is that by reducing the oxygen levels inside the combustion chamber, Nitrogen Oxide (NOx) emissions are reduced. 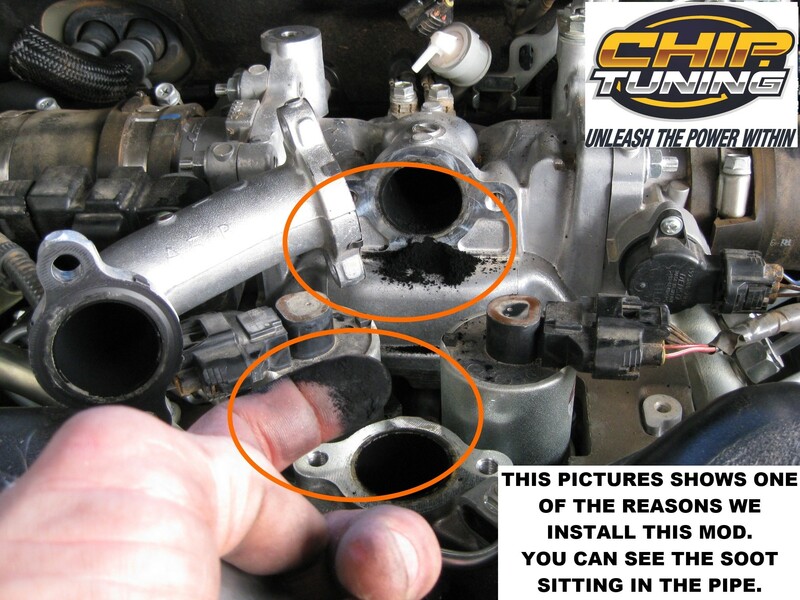 To do this, some of the exhaust gasses are redirected back into the intake manifold via EGR valve. Yes, EGRs do reduce NOx emissions, but at a high price. Mixing hot exhaust gasses with the intake air reduces engine efficiency. The sole reason for using an intercooler is to lower the intake air temps. This makes the air more dense, so we get more air into the combustion chamber. 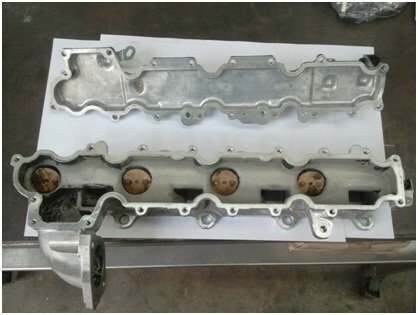 The EGR works effectively to negate the function of the intercooler. So, the EGR will make you use more fuel, give you less power, cause carbon build-up in the intake manifold and ultimately reduce your engine life. But it does reduce NOx emissions, so we are expected to accept it. Blocking the EGR system gives us two main benefits 1) Blocking the EGR will certainly stop the soot from the exhaust clogging up the inlet manifold. See the last picture showing soot taken from a late model 200 Series Landcruiser. 2) When blocking the EGR port you are redirecting the exhaust gases back out via the turbo, (where it was meant to go). The turbo now has more pressure turning the blades and the turbo will spool quicker. Most people will even be able to feel this by the “seat of their pants” dyno. ie you will feel a marginal increase in performance and that’s a good thing. Variable Vane Turbo Charges are also OK with blanking the EGR. 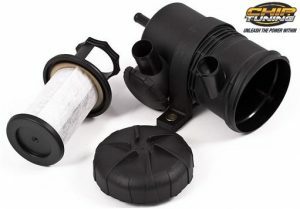 EGR systems ARE NOT in place to help keep the engine from getting hot. This is a myth. The reduction of combustion temps is PURELY an emissions system. This is proven from the fact that at WOT, when the engine would need to most cooling, the EGR system is CLOSED. Yes, the engine is producing more NOx emissions however the reduced throttle position (because of EGR blanking) means you will be using less diesel and producing less soot or particulate matter (PM). Below are some Frequently Ask Questions (with answers) regarding the EGR System. There are many reasons to blank off or restrict as much as possible the EGR System in your vehicle. FAQs Q. What is an Exhaust Gas Recirculation (EGR) valve? A. The EGR valve controls a passageway between the intake and exhaust manifolds. When the EGR valve opens, exhaust gasses flow from the exhaust manifold through the valve and into the intake manifold, keeping NOx emissions within state limits. Some people think the EGR is there to keep valves and cylinders cool. It is not. Q. Why block off the EGR supply port? A. The hot, oxygen-depleted, exhaust gases displace (dilute) the cooler incoming oxygen-rich air and has a quenching effect on combustion and combustion temperatures. 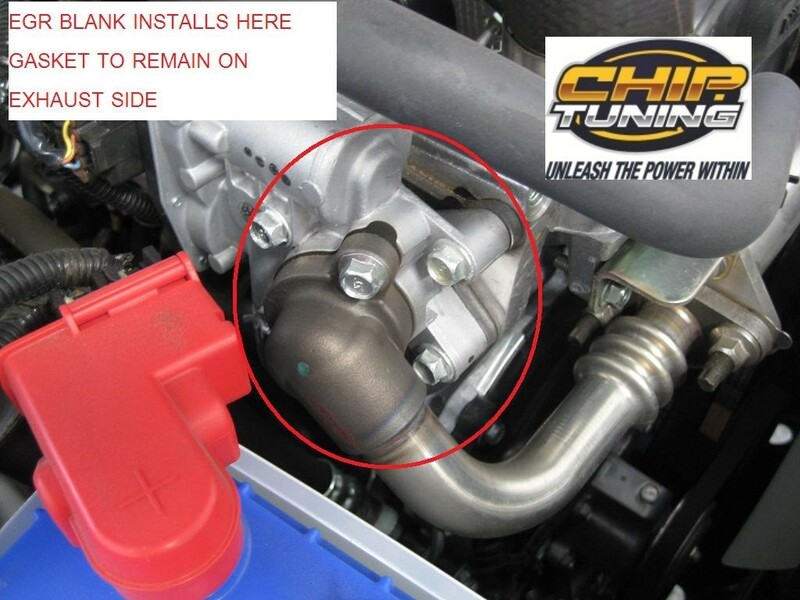 This reduces engine performance and raises intake air temperatures dramatically. For those interested: Testing on a in a 2008 3.2 CRD Mitsubishi with the EGR left standard, even at light cruise at 100km in top gear EGT rose to 380Deg C. With the EGR blanked max EGT at same loads were 300Deg C. A full 80 deg c cooler. Q. 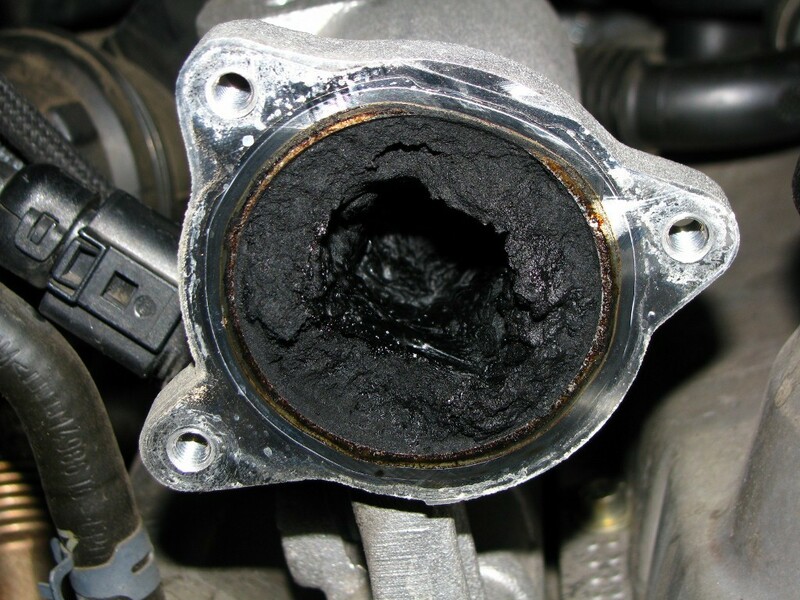 What are the benefits of blocking the EGR port/pipe? A. Many. Cleaner engine oil means increased engine life. Q. 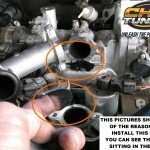 What are the negatives of blocking the EGR System? A. It is against the law to change the way the vehicle’s emission control systems function. However, in Australia there is no road side diesel testing. Road side RTA inspectors or Police will test petrol vehicle for hydro carbons. The emission test for diesel occurs at time of original engine certification. Of course, we leave it up to the customer to decide if they wish to do this mod. We recommend it. NB: EGR Blanking Plates, or Restrictor Plates come free for most vehicles when buying a Tuning Module. When hot gasses from the EGR mix with the oil ladened air, oil vapour that comes from the engine’s crankcase, the hot air cooks the oil and causes carbon build up on the inside of the intake manifold. In the pics below you can see the excessive buildup of carbon. First pic is from a 200 Series Landcruiser with 70,000 kms and shows the soot that is coming from the EGR pre intake manifold. The next 3 pics are from an NS Pajero with less than 160,000kms. You can clearly see that some of the ports are almost completely blocked. The last pic is the same NS Pajero when cleaned. Of course, this is what is should look like. Our EGR Blanking Plate allows the engine to breathe oxygenated air rather than hot exhausted air. Plates fit, Holden, Mitsubishi, Nissan, Ford Territory and Land Rover Defender, Toyota. The EGR blank is easy fit design with slots so that you do not need to fully disassemble the EGR System … just slot the Blanking Plate in. All our EGR Blanking Plates comes with instructions for fitment for your vehicle. For those interested, the info below is actual testing of EGTs with and without a blanking plate in a ML 3.2 Triton Auto. With the EGR untouched, even at light cruise at 100km/h in top gear, the EGTs reached 380 Deg C. With the EGR blanked the max EGT at same loads were 300 Deg C. Metal/Steel grain transformation starts at approx 700 Deg C and normalisation at 900 Deg C. But who’s over 700 Deg C anyway 🙂 Whilst at 160km + at 22 PSI measured on a EGT and Boost Gauge; At 3000+ RPMs with over-drive off the EGTs were lucky to reach 420 Deg C.
On the subject of Emission Control, PCV system is another “fantastic” idea. Burnt fuel contains contaminates that used to go straight out the exhaust pipe. Now, some of these contaminates (including soot) are being redirected back into the combustion chamber. Engines experience varying levels of piston blow-by, where some of the exhaust will go past the rings and into the engine sump. The more contaminates there are in the exhaust gasses, the more contaminates end up in the engine oil. Contaminated oil will have detrimental effects on engine oil thus reducing its ability to protect the parts its was designed to protect. 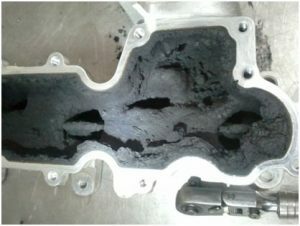 The positive crankcase ventilation (PCV) valve can vent a small amount of oily mist into the intake manifold. 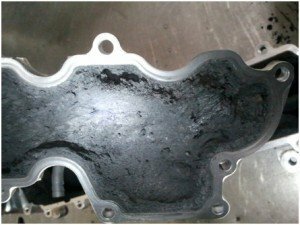 When this oily mist comes into contact with the soot from the exhaust gas it can form deposits on the walls of the intake manifold. 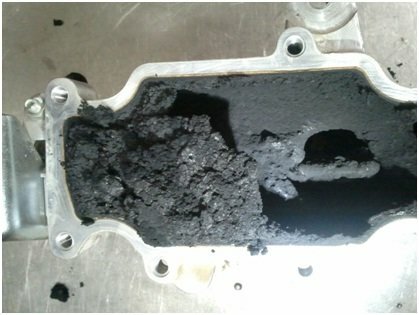 Over time these deposits get baked into a solid mass which can seriously affect air flow through the manifold.